We are being asked by more and more people in our shops about whether our ice cream is suitable for people on a range of diets including coeliacs and the lactose-intolerant. So, I thought I’d say a few words about ice cream and special diets. I don’t think that most coeliacs realise that most ice cream is gluten-free (unless it has biscuits in it, and of course it’s important to read the label!). All of our ice cream is gluten-free except two made with cookies and our tiramisu, which we only do occasionally. There is also a wonderful Viennese cake, the Sachertorte, which is traditionally gluten-free (almond flour is used). I’ll put a recipe for it up here soon. People who are lactose-intolerant and like their frozen desserts should look for sorbet. Sorbet is generally made with water, sugar, and fruit, and although Nero is purported to have invented it, you shouldn’t hold that against this delicious dessert! 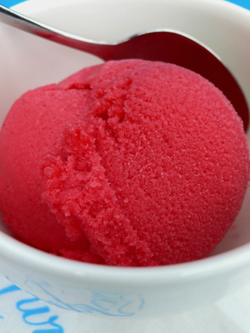 Our raspberry sorbet (photo above) is one of our best-loved bestsellers. Some people add egg whites to sorbet, but we’ve never been in favour of it since it can make the sorbet seem even sweeter and much less fresh-tasting. Although sorbet can be high in calories, it’s generally fat-free as well. Finally, there is the difficult case of diabetes. We’ve tried for a long time to come up with a reduced- or no-sugar ice cream, without much luck. Ice cream needs a certain amount of solids that is usually provided by sugar, and we’ve not found a viable substitute (we’ve even tried tapioca). Of course, we have a few self-imposed restraints – it has to taste great, and we don’t have much interest in using anything that is not natural. The Diabetes Federation of Ireland has told us that the current thinking is that diabetics should monitor their sugar intake and be wary of products claiming to be “suitable for diabetics.” Still, that takes a bit of the fun out of it, and human nature being what it is, we would love to come up with something that diabetics can enjoy without too much worry. Their packaging into Europe is much better than on that site and their icecream is lovely. I am vegan and always on the lookout for “creamy” icecream. This is the closest I have tasted. Coeliacs have to be really careful about what they eat in case of gluten contamination. Ice-cream could be composed of products that SHOULD be gluten free but may not be due to the factories in which they were processed. Unless you have ensured that all your ingredients, such as nuts, choc, etc, are gluten free you cannot claim the ice-cream itself is gluten free. The absence of obviously gluten-containing items such as cookies does not in fact mean that the ice-cream is gluten free. Also there may be risk of cross contamination during the manufacturing if the two ice-creams made with cookies are manufactured near the other ice-creams. Are all the ingredients in your ice-creams certified gluten free? Hi there, Una! Thanks for your comment, and your point is a good one – that statement of mine about ice cream in the above post was definitely too broad. I also didn’t know there was gluten-free certification, so I thank you for bringing that to my attention. When we say an ice cream of ours is gluten-free, we have checked every single ingredient going into it, including chocolate, nuts, etc. – though we haven’t checked for certification. As you say, there is a chance of cross-contamination, so anyone with that level of gluten intolerance should definitely ask! Great to see that you are making ice cream for people who have dietry restrictions….